The genomic 16S rRNA gene sequence of R. mesophilum DSM 19309T was compared with the Greengenes database for determining the weighted relative frequencies of taxa and (truncated) keywords as previously described . The most frequently occurring genera were Paracoccus (45.3%), Loktanella (30.3%), Rubellimicrobium (14.0%), Methylarcula (8.4%) and 'Pararubellimicrobium' (2.0%) (58 hits in total). Regarding the five hits to sequences from other members of the genus, the average identity within HSPs was 94.9%, whereas the average coverage by HSPs was 99.3%. Among all other species, the one yielding the highest score was 'Pararubellimicrobium aerilata' (EU338486), which corresponded to an identity of 96.3% and a HSP coverage of 98.0%. (Note that the Greengenes database uses the INSDC (=EMBL/NCBI/DDBJ) annotation, which is not an authoritative source for nomenclature or classification). The highest-scoring environmental sequence was JF417792 (Greengenes short name 'microbial structures coalbeds located Eerduosi Basin China coalbed clone QQSB73'), which showed an identity of 98.7% and a HSP coverage of 99.6%. The most frequently occurring keywords within the labels of all environmental samples which yielded hits were 'skin' (10.6%), 'fossa' (5.9%), 'poplit' (4.2%), 'forearm, volar' (3.3%) and 'sea' (2.8%) (192 hits in total). Environmental samples which yielded hits of a higher score than the highest scoring species were not found, indicating that R. mesophilum has rarely been detected in the environment. Cells of strain MSL-20T stain Gram-negative, are described to be motile (without a flagellum) , and ovoid or rod-shaped, 1.6-3.4 µm in length and 0.4-0.7 µm in width (Figure 2 and Table 1). On Reasoner’s 2A (R2A) agar they form pink to light red-pigmented colonies. According to , cells are negative for oxidase (but see below) and nitrate reduction activities, but show only weak catalase activity. They hydrolyze starch and Tween 80, assimilate cellulose, histidine, leucine and fructose, but do not utilize citrate and propionate. Cells test positive for leucine arylamidase, naphthol-AS-BI-phosphohydrolase and α-glucosidase. Growth is observed in a temperature range of 20-37°C with an optimum at 28°C. The pH range for growth is between pH 7-11 with an optimum at pH 7.0 ± 0.2. No growth occurs in the presence of NaCl in concentrations of 0.5% and above. Cells of strain MSL-20T do not utilize the carbohydrates cellobiose, D-mannose, salicin, D-xylose, α-melibiose, D-sorbitol, L-malate and D-ribose, which are utilized by its close relative R. thermophilum DSM 16684T (all data from ). Phages are widely distributed and abundant in marine and freshwater environments [38-40] and are known to be horizontal gene transfer agents that drive bacterial diversity [40,41]. Temperate phage genomes can be integrated in the host genome as prophages and perform a symbiotic relationship with their hosts . Several Gram-negative bacteria produce and release chemical signal molecules called autoinducers. In correlation to the population density they detect those signal molecules and respond with an alteration of gene expression and therefore with diverse behaviors (e.g., luminescence, virulence, antibiotic resistance, changes in morphology and cell division) [43-46]. 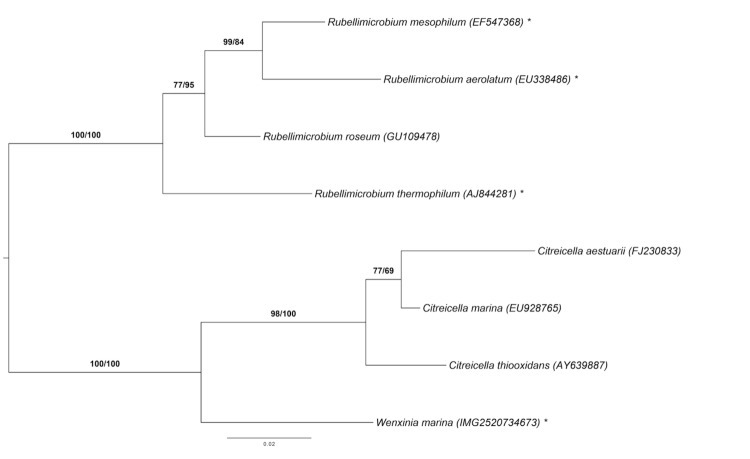 Figure 4 depicts the fraction of shared genes between the two genome-sequenced Rubellimicrobium type strains and the type strain of Wenxinia marina , another closely related member of the Roseobacter group (see Figure 1). The number of pairwise genes was inferred from the phylogenetic profiler tool of the IMG platform. Homologous genes were detected with an E-value cutoff of 10-5 and a minimum identity of 30%. 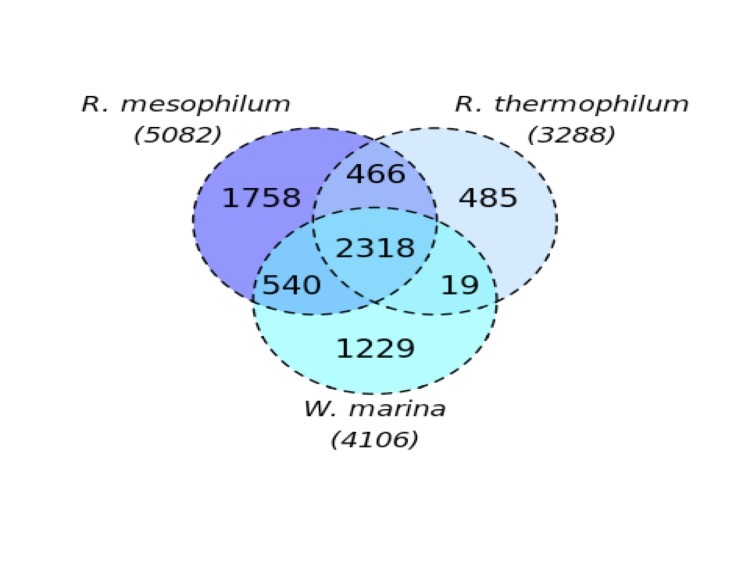 Proportions of 56% and 45% of the gene count in W. marina and R. mesophilum, respectively, are shared between all three genomes. In the case of R. thermophilum, a fraction of homologous genes of 70% is present in the other two genomes. Very few genes are shared only between R. thermophilum and W. marina. Garrity GM, Bell JA, Lilburn T. Phylum XIV. Proteobacteria phyl nov. In: Brenner DJ, Krieg NR, Stanley JT, Garrity GM (eds), Bergey’s Manual of Sytematic Bacteriology, second edition. Vol. 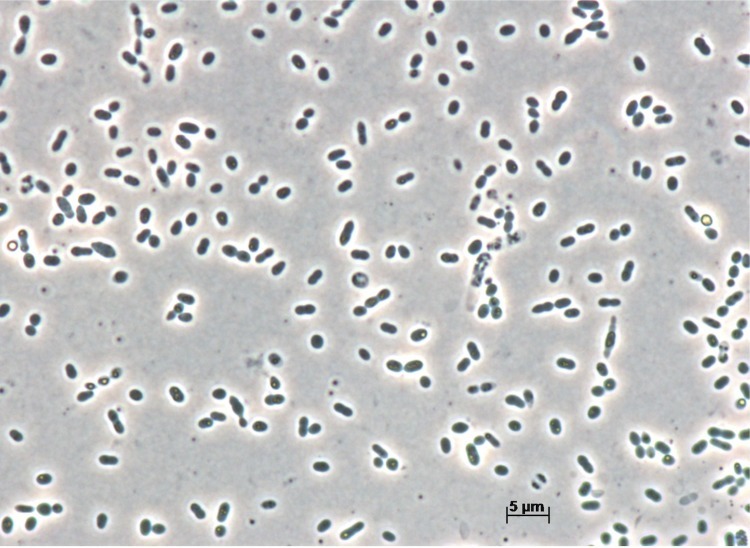 2 (The Proteobacteria), part B (The Gammaproteobacteria), Springer, New York, 2005, p. 1. Garrity GM, Bell JA, Lilburn T. Class I. Alphaproteobacteria class. nov. In: Brenner DJ, Krieg NR, Stanley JT, Garrity GM (eds), Bergey’s Manual of Sytematic Bacteriology, second edition. Vol. 2 (The Proteobacteria), part C (The Alpha-, Beta-, Delta-, and Epsilonproteobacteria), Springer, New York, 2005, p. 1. Garrity GM, Bell JA, Lilburn T. Order III. Rhodobacterales ord. nov. In: Brenner DJ, Krieg NR, Staley JT, Garrity GM (eds), Bergey’s Manual of Systematic Bacteriology, second edition. vol. 2 (The Proteobacteria), part C (The Alpha-, Beta-, Delta-, and Epsilonproteobacteria), Springer, New York, 2005, p. 161. Garrity GM, Bell JA, Lilburn T. Family I. Rhodobacteraceae fam. nov. In: Brenner DJ, Krieg NR, Staley JT, Garrity GM (eds), Bergey’s Manual of Systematic Bacteriology, second edition. vol. 2 (The Proteobacteria), part C (The Alpha-, Beta-, Delta-, and Epsilonproteobacteria), Springer, New York, 2005, p. 161. Finn DR, Clements J, Eddy SR. HMMER web server: interactive sequence similarity searching. Nucleic Acids Research 2011, Web Server Issue 39:W29-W37. Ackermann HW, DuBow MS. Viruses of Prokaryotes. Vol I. General Properties of Bacteriophages. CRC Press 1987; Inc.: Boca Raton, FL. Riedel T, Fiebig A, Han J, Huntemann M, Spring S, Petersen J, Ivanova NN, Markowitz V and Göker M. Genome sequence of the Wenxinia marina type strain (DSM 24838T), a representative of the Roseobacter clade isolated from oilfield sediments. Stand Genomic Sci. (under review).